Low Market Volatility Portend Future Risk? The consideration of market volatility from a value-oriented perspective is quite different than traditional risk considerations. Rather, from a value slant, the current period of low volatility is raising additional risks, not opportunity. It is important that investors understand this and know what to expect from their investments during the next period of high market volatility. The period marking the biggest risk is in the low volatility period right before a shift in period (or regime) from low volatility to high volatility. The problem we as investors face is that the two periods are asymmetrical. Low volatility periods are marked by longer time frames and positive escalator-like returns. High volatility periods are punctuated and marked by negative elevator-like returns. In my opinion, the shift from low volatility to high volatility is when valuation risk is realized. Why? Because low volatility periods generate a reinforcing feedback loop that drives greater participation in the market both in traditional long-only, buy-and-hold strategies and through the use of leverage. During this period, valuation plays second fiddle to market returns. The shift to a high volatility period clears the imbalances in the market whether it is in valuation, leverage, or resetting long-term growth trends. Therefore, investors want exposure to the low volatility period and not the other. However, timing is difficult and investment strategies must be optimized between the two. Value investors sensitive to the price of the market are likely to reduce exposure through increased cash as the imbalances continue to build. Unfortunately, that will drive underperformance relative to a fully invested, buy-and-hold strategy during periods of low volatility — making it less appealing, when it is likely most appropriate. Volatility tends to be influenced by its most recent state. Back in 1963, Mandelbrot wrote “large changes tend to be followed by large changes, of either sign, and small changes tend to be followed by small changes.” This volatility clustering is what delineates periods of low and high market volatility. 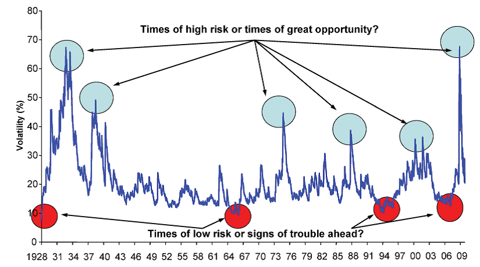 Figure 1 from James Montier at GMO suggests that volatility troughs are cautionary points before market downturns. In a research note I published last week, I discussed how those periods marked by red were also at times when Shiller’s 10-Yr Cyclically Adjusted Price-to-Earnings (CAPE) was at 24X or greater and the trailing 12-month earnings were significantly above the long-term average. 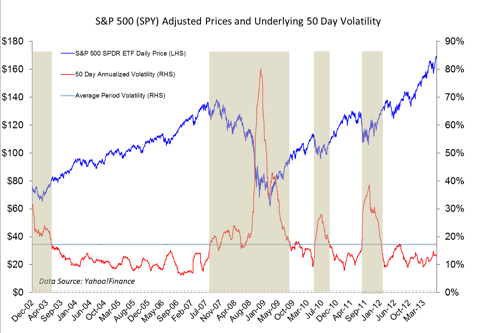 Figure 2 details the last 10 years of the S&P 500 (SPY) combining the 50-day historical (realized) volatility and the actual return on an adjusted price basis (prices are adjusted for dividends received). The browned-out areas reflect the periods of high volatility based on the volatility reading relative to its long-term average. The last high volatility period was during the contentious 2011 US debt ceiling debate. Clearly, you can see the asymmetry between the low and high volatility regimes. The crossover of volatility above its long-term average is closely associated with (local) market tops. The current low volatility regime has been in place since February 2012. Our current market return over this period has been ~29% or ~19.8% annualized. Despite my concerns last summer when volatility was approaching the long-term average — volatility briefly kissed the average before receding again. The S&P 500 is at an all-time high. Any investment bought and held over the past 10 years will be positive. (The key is buy-and-hold, and not panic-and-sell). Use of margin (borrowing to invest) in the equity market expands during low volatility periods. The contribution to any positive momentum (and trend) by its nature reduces volatility. Regret versus the “Great Rotation” is driving new investors and fresh capital into the market. Consider that at any time over the past 10 years — an investment (buy-and-hold) in the S&P 500 (including dividends) would be positive today. Even the 50+% drawdown that began in October of 2007 was finally recovered last August on a total return basis. In other words, the S&P 500 is at all-time highs on a total return basis. Instead of showing the market at an all-time high, consider previous declines experienced in a portfolio that held only the S&P 500. This is a risk measurement tool called maximum drawdown. 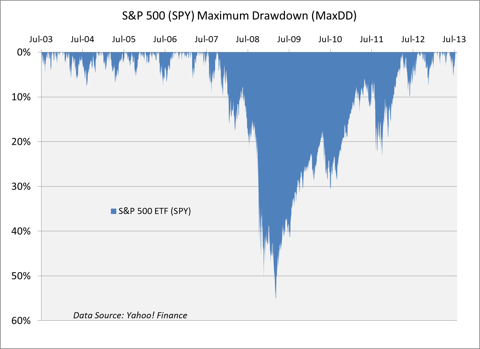 Maximum drawdown calculates the peak-to-trough decline in an investment (in this case, the S&P 500). When it is at 0%, the investment is at an all-time high. The recovery in the decline in October of 2007 took almost 5 years (August 2012). Therefore, the memory of the 2007-2009 decline, while painful, will fade for those who maintained a strong discipline in a buy-and-hold strategy. Those investors with cash in 2009 have done very well. With the market at all-time highs and the memory of losses fading, leverage through the use of margin debt is increasing. While margin debt as an absolute number is influenced by the overall size of the (growing) market — clearly the generation of peaks indicate investors’ increased level of risk taking based on the low volatility environment and positive market momentum. By definition, the existence of positive price momentum will lower the volatility of the market, which creates a powerful reinforcing factor. 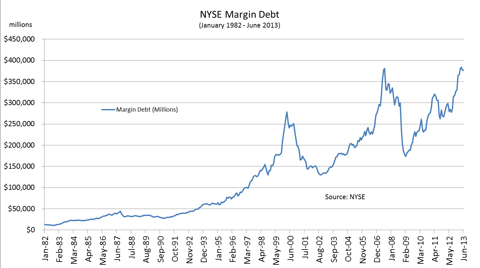 As shown in Figure 4, the recent spike in margin debt coincides rather tightly with current low volatility period. Is there really a “Great Rotation” from stocks to bonds, or is this really a matter of buy-and-hold gaining traction? We have already shown that given the market highs, a buy-and-hold strategy initiated over the past 10 years would be positive. Furthermore, a dollar cost average program such as in a 401(k) would have done even better. Consider those investors who have been on the sidelines since the 2007-2009 market downturn or have allocated retirement contributions to a money market account? How long can an investor stand idle seeing the past 4 years of stock market gains pass them by when all they had to do was own the market. Pyramis Global Advisors recently put the issue in terms of investors balancing two types of regret: Active and Inactive. Active: Active Regret reflects the regret of losses sustained in a market downturn. Active Regret fades over time along with the memory of the losses. Inactive: Inactive Regret reflects non-participation in market upturns. As markets continue to rise, Inactive Regret builds. Analysis of capital flows into equity mutual funds and ETFs helps put the Active/Inactive Regret theme in context. During the 2009-2012 time period — money flows into equities were essentially flat. This would suggest the dominance of the Active Regret, which remained strong given the recent memory of the 2007-2009 market downturn and distrust in the market. However, data from Pyramis shows that for the first 5 months of 2013, money flows into equities has been decidedly positive, which suggests that after 4 years, the Inactive Regret for many investors has become more influential (and intolerable) and investors have shifted capital back into the stock market (largely at the expense of money market funds). The S&P 500 has been in a low volatility period for 17 months and shown solid gains. Current volatility is ~13% versus long-term average of 17-18%. In March, volatility reached a low of ~9%. Memory of losses has faded as any investment in the S&P 500 over the past 10 years would be positive today using a buy-and-hold strategy and retaining dividends. Leverage based on NYSE margin debt has accelerated during the most recent low volatility period with a near-term peak currently in April. Based on mutual fund and ETF flow data, cash is moving back into equities for the first 5 months of 2013 after being flat the previous 4 years. Few long-term investors will get the timing correct on the next shift in the volatility period. Value investors in particular are notorious for being too early both in raising cash to early and buying too soon. While initial timing calls are proven incorrect and the low volatility period is sustained, the market continues to climb, confidence increases (and caution declines), valuations expand, and leverage is utilized. While timing is a challenge, a caution flag is clearly warranted under the current market conditions. If Mr. Montier were to update the chart in Figure 1, a fifth red circle would likely be added to March of this year. Besides the low volatility conditions, the current period is similar to those four other market periods identified in red circles based on the S&P 500 10-yr CAPE of 24X or greater and trailing 12-month earnings significantly above the 10-year average. Regardless of the style of investing from value-oriented, passive indexing, or tactical allocation strategies, know that all portfolio strategies and asset allocations will likely be stress tested at some point in the near future. As the low volatility period shifts to a high volatility period — valuation risk will likely take center stage again. There are actually numerous investment disciplines that I believe are effective over the long-term, including a buy-and-hold approach. The problem, in my view, is that investors constantly switch their discipline when it isn’t performing well at the time. Since 2000, a buy-and-hold approach would have required an investor to suffer through one 50% market loss and a second, distinct 55% market loss. Frankly, I think another one of a similar order will complete the present market cycle. Over the very long-term, buy-and-hold investors have done fine, particularly combined with good value-conscious stock selection. But the drawdowns can be intolerably deep from our perspective, and the full-cycle returns following points of rich valuation tend to be particularly disappointing compensation. I expect that this will be true over the coming decade as well. This article was posted in Market Analysis.